Upon successful completion of an encoding job, access the job's menu by right-clicking it in the job list or by selecting it and using the menu button at the bottom of the Jobs panel. Then, choose Measure Video Quality. A file dialog opens for you to enter the name of a text file to contain a report containing PSNR and SSIM values for each video frame. When the measure job completes successfully, open its menu in the same manner to view the report or to open an original-on-top/encoded-on-bottom view in the player. No longer auto-plays upon opening a playlist and multitrack project. 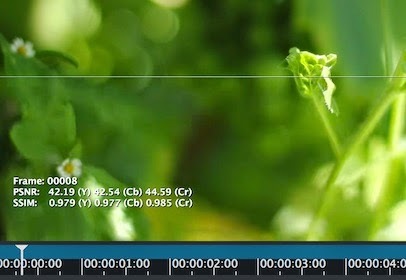 Auto-select all text upon giving a timecode field focus. See the Keyboard Shortcuts page for info about entering time values.